As of the 30th of August 2019, Personal Capture (the software which allows us to record audio, video and laptop display) will no longer appear as a download option on the Echo360 platform. From the 15th of January 2020, it will be discontinued altogether – with Echo360 no longer supporting any technical queries from this date. Personal Capture is being replaced by Universal Capture, which is available to download now. The software allows users to record content much the same way as Personal Capture does, however the software is more reliable and ‘packages’ and uploads content as you record, meaning that the recording is available for publishing/sharing much sooner. 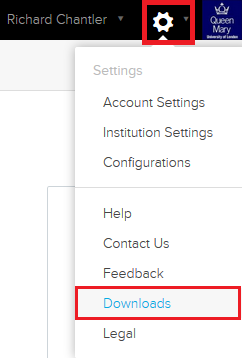 To download Universal Capture, login to Echo360 directly via Echo360.org.uk and enter your QMUL email address, then choose Queen Mary University of London from the drop-down menu. You will then be prompted to enter your QMUL username and password to pass through the ID check. Once logged in, click on the cog in the top right corner of the screen and select ‘Downloads’ from the drop-down menu. Should you have any recordings which have been made using Personal Capture which you have not yet published, we would advise that you publish these (uploading them to your Library) to ensure that they are available to you post January 2020.